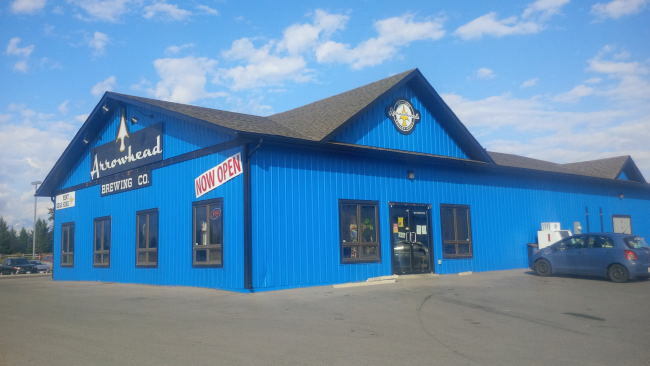 Located in Invermere BC very close to the British Columbia, Alberta border you will find Arrowhead Brewing Company. This brewery nestled in the heart of the Kootenays has some amazing style! The owners of the brewery have been collection all kinds of memorabilia for years. When they finally opened a brewery they had somewhere to display all of their crazy stuff! The brewery also has one of the best collections of swag for purchase of any brewery that I have been to in the entire province! I left with a shirt as I could not help myself! The bar itself is quite neat as they have incorporated some of their interesting chalk boards that are used to promote their beer. The bar sells samples of their beer, bombers, cans and growler fills using a proper pressurized growler filler (one of only two in the Kootenays). With a small window into the brewery on one of the walls the brewery does not usually do tours. They are very small and very busy but I was able to contact them a few weeks before my stopping by and was able to secure a quick tour. Blogging does come with some perks. They are a small micro brewery but still big enough to make a decent amount of beer that is distributed to portions of the Kootenays in kegs and bombers. They even have their beer in one Liquor Store in Vancouver but only because the liquor store pays the shipping cost themselves. This liquor store is Darby’s Public House and Liquor Store. The brewhouse is quite unique in BC as it is a copper system. It has a very interesting look and fits in with the style of the tasting room as it is different. At the time of visiting the brewery I had no idea what to expect as I had only ever had one of their beer on tap and it was at a pub that did not display their branding. I really love the funky style they have and their beer holds up to that same standard! If you can not make it out to the Kootenays I hope you can at least find a bottle possibly at the one location in Vancouver. This entry was posted in Beer Travel, Brewery and tagged arrowhead brewing company, beer, craft beer, funky, invermere, kootenays, memorabilia, road trip.